Energy: An entity that makes matter move. The ability to do work. Work: A force that is exerted on an object that causes it to move through a distance. Power: The rate at which work is done on an object (or the rate at which energy is transformed). The amount of energy that is put into a football is tremendously high. The one main potential energy used in a football is gravitational potential energy. When a football is being held by a wide receiver or quarterback, the football has gravitational potential energy. The main types of used energy that are used in a football are kinetic energy and heat energy. So when the quarterback is about to throw the football, or the kicker is about to kick the football, there is 100% of gravitational potential energy. Once the football is thrown we will say 80% of the gravitational potential energy is kinetic energy and 20% is heat energy. 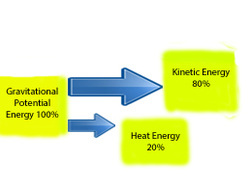 Now we know that the 80% of kinetic energy is useful because it helps the football travel to its destination, but the 20% of heat energy is wasteful energy because it is not used to help the football travel to its destination. In this next example we will determine the kinetic energy used for a NFL football (400g) thrown at 15.0m/s and the gravitational potential energy of the football. We will say the height of the ball is 2.4384 metres. The formula for kinetic energy is: Ek (kinetic energy) = (1/2)mv^2 (where 'm' represents the mass of the object (kg) and 'v' represents the speed of the object (m/s). The formula for gravitational potential energy is: delta (represented by a triangle) Eg (change in energy from the ground to the raised height) = mg delta h (where 'm' represents the mass of the object (kg), 'g' represents the acceleration of gravity and 'delta h' represents the change in height). The measurement of both kinetic energy and gravitational potential energy is joules (J). Therefore the NFL football has 45.0 joules of kinetic energy. Therefore the NFL football has a potential energy of 9.6 joules. A NFL quarterback such as Ben Roethlisberger puts a tremendous amount of work into throwing a football. Ben is 6'5 and weighs 241lbs. making him one of the largest quarterbacks in the NFL. Therefore he needs to apply less force in order to throw the football a farther distance. Work is done when a force is applied to an object through a distance. The equation for work is: W = Fapplied x delta d (where 'W' is the work done (J), 'Fapplied' is the force (N) and delta d is the displacement (m). If Ben applies a force of 1050N on a football that travels 70 yards (64.008 metres), then we will determine the work Ben has done. W = 1050 x 64.008, W = 67,208.4 joules (with significant digits the answer is 67,200 joules). Therefore the amount of work Ben has done in order to throw 70 yards is 67,200 joules. P = 13,373.1w (with significant digits the answer is 10,000w). Therefore the amount of power Terry needed to throw this pass was 10,000 watts or 10 kilowatts.